Pondering galaxy-sized questions, Cosmic Ground entered the concert hall. 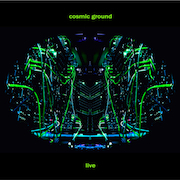 Compiling performances from two 2016 events (E-Live & The 9th Psychedelic Network Festivals), Dirk Jan Müller and Horst Porkert have realized the album Cosmic Ground Live (77'49"). The four tracks where made in the heat of the moment, as these conditions are known for revealing the creative spark, and finds both musicians and their listeners experiencing the music together in the act of being made. The trick is for neither to become too lost in the process. Cosmic Ground Live begins broodingly downbeat, with dark forms rising from out of dark corners of the mind. Bass laden drones try to swallow a melodious Mellotron flute solo, which lilts blessedly above a maelstrom of writhing timbres. Wrapped in a luminous halo of reverberation a string section rises from the deep dense rumbling electronic tempest, before the introduction of Müller's signature breathless tone patterns - which mount, repeat and seem to echo out across eternity. 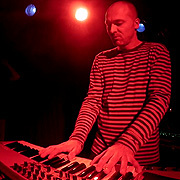 A demon behind the sequencer, he occasionally observes the audience - who will always tell you which way to go. Each new ascent presents the classic sound of one or another vintage synthesizer, and a shivery reverence that defies explanation. Weeping choirs and full-throated waveforms endow this release with greater passion. The compression that comes from these reprieves of stillness intensifies feelings found in the passages of acceleration. With each set, our Spacemusic mystics manage to conjure a stimulating atmosphere of mystery, adventure and motion. Once inside this expansive zone, we may travel to the place where lives our dearest hopes and dreams. Cosmic Ground Live glows with mystery and possibility, pushing through the outer limits of mainstream constraints. This is the music we may turn to whenever we need proof that further possibilities for representing innovation, mystery and drama in music still lie out there; in an ever-receding possible elsewhere. These kinds of live concerts are a spectacle of wires, electricity and wits - something that trusts all who hear it to think.